The Edmonton Oilers gather at their bench during a break on Saturday. Jim Harrison’s Edmonton Oilers record for points in a game might be jeopardy one day, if Connor McDavid has anything to say about it. Way back on Jan. 30, 1973, Harrison notched 10 points for the Oilers in one game during their inaugural season of professional hockey in the World Hockey Association with three goals and seven assists, when club was still known as the Alberta Oilers. The Oiler thumped the New York Raiders that night 11-3. For those that saw McDavid play during Saturday’s NHL exhibition game at the SaskTel Centre in Saskatoon, one could see him possibly matching or breaking that record during one extremely hot performance. He could easily match the Oilers NHL record for points in a game at eight, which has occurred four times in team history with the last coming from Sam Gagner on Feb. 2, 2012. The 18-year-old centre only had one assist during the Oilers 3-0 victory over the Minnesota Wild, but he was the best player on the ice. During his whole hockey career to this point, the Newmarket, Ont., product has been labeled a phenom. The label fits. McDavid is one of three players in the history of the Ontario Hockey League to be granted Exceptional Player status, which allowed him to play a full season in the major junior ranks at age 15. Normally, a player has to be age 16 to play a full campaign at the major junior level. Last season, McDavid, who stands 6-foot-1 and weighs 195 pounds, piled up 44 goals and 76 assists in 47 regular season games with the Erie Otters. He went on to net 21 goals and 28 assists in 20 post-season contests. When he wasn’t in the OHL, McDavid was a hero helping Canada win gold at the world junior hockey championships back in January posting three goals and eight assists in seven games. The 7,541 spectators that saw McDavid play on Saturday will have to admit they saw something special that night. He could have easily had six or seven points in that contest. Playing on a line with Leon Draisaitl and Anton Slepyshev, McDavid made a number of beauty passing plays to create scoring chances. When he passed the puck, it seemed to have eyes. On one play in the first working in tight on the Minnesota goal, McDavid made a blind backwards pass that landed on the tape of Slepyshev’s stick. The Russian had an open net to shoot at, but looked surprised for a second his linemate made such a play. Slepyshev failed to score. The pair had a two-on-one chance a few minutes later, but Slepyshev fanned on shooting a perfectly placed set-up pass from McDavid. Besides his playmaking, McDavid also created a pair of breakaways. Early in the second, McDavid had his first breakaway, but he was turned away by Wild goaltender Darcy Kuemper. In the third, McDavid stole the puck from a Wild defender at the Minnesota blue-line to create his second breakaway, but he fired a shot just wide of the goal. Gretzky is the top hockey icon in Canada, whose gift for the game of hockey allowed the Oilers to win four Stanley Cups in the 1980s. He also stood out on the international stage helping Canada win Canada Cup titles in 1984, 1987 and 1991. After his playing days wrapped up, Gretzky put together Canada’s gold medal winning team at the 2002 Winter Olympics in Salt Lake City, Utah, and his post-game media tirade following 3-3 draw with the Czech Republic to close the preliminary round help rally a country to the Canadian flag to power the playoff round push. To say McDavid might one day become an all-time hockey great like Gretzky or Mario Lemieux might be too much to ask. If McDavid has a career that is similar to Bryan Trottier, Dale Hawerchuk, Teemu Selanne or Jarome Iginla, that might be a more realistic expectation. McDavid was the first overall selection in June’s NHL Entry Draft, and the draft’s history is loaded with first overall busts as well as stars. As the years move on, McDavid has to continue to work on his physical conditioning. Most NHLers are well built men, and 18-year-olds tend to have the bodies of high school graduates, which is often something that can’t be circumvented due to the natural development of the human body. In the old days of hockey when players didn’t train year round, it was easier for an 18-year-old to break into the NHL and have a huge immediate impact. When talent does work hard, you get players like basketball legend Michael Jordan, football great Warren Moon, Iginla and Gretzky. McDavid’s career must be allowed to play out for what it is. If he does realize his potential, Harrison’s long standing record may finally go up in smoke. The Oilers and Wild set for a faceoff in the Minnesota zone. It is always hard judge how good an NHL exhibition tilt is, especially when don’t ice what would be a normal regular season roster. Under the guidance of new head coach Todd McLellan, the Oilers played with a lot more structure than they did when they visited Saskatoon in the 2014 pre-season, when they fell 5-0 to the Chicago Blackhawks. The habits the Oilers are focusing on new will help them when the regular season rolls around. Will they end their drought of not making the NHL playoffs that dates back to 2006, when they last made the Stanley Cup finals, that might still be a see it to believe it thing. The attendance figure of 7,541 has to be viewed as a disappointment, but not unexpected. 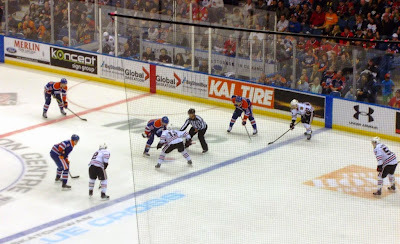 Last year’s game drew 10,760 spectators, but since Toronto-based promoter John Graham started bringing NHL pre-season games to Saskatoon starting in 2009, locals saw their fair share of dud games. With ticket prices ranging from $59.50 to $112 including fees, ticket buyers likely did not want to suffer through watching a contest where usually half the players were not full-time NHLers from the previous season. The fact the Oilers confirmed McDavid would play the day before the contest didn’t provide enough time for some to possibly reconsider going. This year’s game overall was better than last year’s when the Blackhawks claimed victory over the Oilers. Was it good enough to warrant paying the high ticket prices, that is debatable, but ticket buyers were likely better off spending their money elsewhere. The Wild dressed a lot of non-NHLers, so they could ice more of a regular roster at home on Sunday, when they thrashed the Winnipeg Jets 8-1. Don’t underestimate how big of a fan base the Oilers have in Saskatoon and area. Most of the crowd showed up wearing Oilers gear. You almost felt like you were in Edmonton. In recent years, the Oilers had a reputation for being not all that friendly media wise, when it came to accessing players for interviews. At last year’s NHL exhibition game, you had to pester team officials to get players you requested. Now under new general manager and president of hockey operations Peter Chiarelli and McLellan as head coach, the media area was flooded with all sorts of players for post-game interviews after this year’s contest. Access wasn’t a problem, and it seemed like everyone was up for answering questions. For those that wanted to talk to Russian product Slepyshev, whose English isn’t that strong, his countryman and Oilers teammate Nail Yakupov provided services as an interpreter. While the Oilers were the big attraction, there were strong cheers for Wild netminder Kuemper, who is from Saskatoon. He looked strong stopping 27 of 29 shots fired his way playing in front of a large contingent of family and friends. Oilers left-winger Luke Gazdic and Wild defenceman Marco Scandella had a spirited fight near the end of the third period shortly after the Oilers iced the contest with an empty-net goal. I worked Saturday’s game for The Canadian Press. If you want to see that story, you can do so on the TSN site by clicking right here. 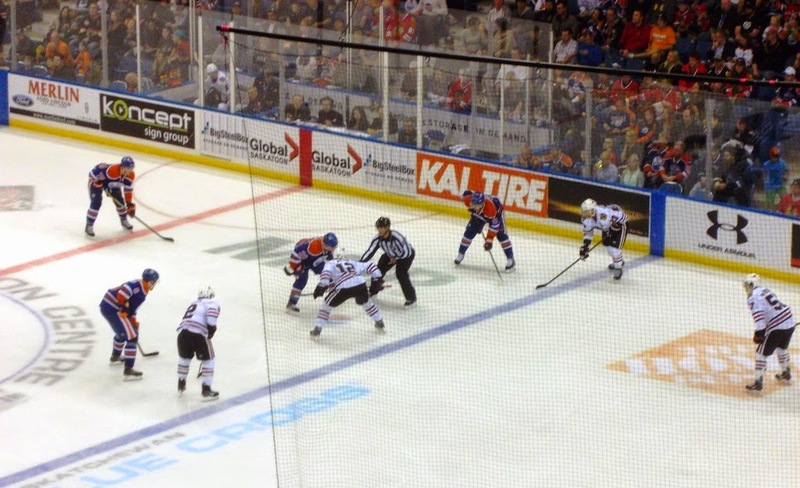 Edmonton and Chicago met in an NHL pre-season game in Saskatoon last year. Connor McDavid needs play in Saskatoon to give Saturday’s NHL exhibition contest a chance to have bang for the buck. The Edmonton Oilers are slated to square off with the Minnesota Wild on Saturday at 4 p.m. at the SaskTel Centre, and everyone wants to know will the 18-year-old phenom play or not? As of late Thursday, reports coming from the Edmonton media state no decision has been made if McDavid will suit up in Saskatoon, or Friday when the Oilers travel to Winnipeg to face the Jets. McDavid could play in both games. If McDavid doesn’t play on Saturday, spectators may be well advised to save their money and do something else. Almost a year ago on Sept. 28, 2014, the Oilers fell 5-0 to the Chicago Blackhawks in a lackluster pre-season tilt in Saskatoon. A crowd of 10,760 spectators saw both sides ice rosters where only half of their players spent time in the NHL in the 2013-14 campaign. With so many non-NHL players on the ice, it seemed like those in the building weren’t all that enthusiastic about what transpired. There was cheering, but there wasn’t as much cheering as you would expect. Spectators paid $59.50 to $112 per ticket including fees, but in all honesty, they basically threw their money away. Ticket prices for this year’s game in Saskatoon have the same price range. If this year’s contest mirrors last year’s, fans would be wise to spend their money elsewhere. You could take your significant other to a nice dinner at one of the many great eating establishments in downtown Saskatoon, or hit up Earls on 2nd Avenue. If McDavid takes the ice to play on Saturday, the buzz will hit the point that the SaskTel Centre will be the place to be. He was a hero helping Canada win gold at the world junior hockey championships back in January posting three goals and eight assists in seven games. With the Ontario Hockey League’s Erie Otters last season, McDavid, who stands 6-foot-1 and weighs 195 pounds, potted 44 goals and 76 assists in 47 games. The Newmarket, Ont., product had 21 goals and 28 assists in 20 post-season contests. The 18-year-old centre had a pair of assists in the Oilers 4-2 pre-season win over the Calgary Flames on Monday at Rexall Place in Edmonton. McDavid is viewed as a once in a generation talent, and that alone would make Saturday’s game compelling for the masses, if he plays. With that said, the game could still be dud, even if McDavid does play. Barring something unforeseen like a major injury, McDavid will be on the Oilers roster for their regular season opener, when they travel to St. Louis on Oct. 8 to take on Blues, so a sure thing player will only put so much effort into a game that doesn’t mean anything in the regular season standings or the playoffs. The Oilers brass said that McDavid will be in Saskatoon regardless if he plays or not on Saturday. Hopefully, he will be on the ice and not sitting in a luxury box. UPDATE - Oilers head coach Todd McLellan announced on Friday that McDavid will dress for his team's exhibition game on Saturday in Saskatoon. Saturday's game will be McDavid's second outing of the pre-season. The Blades celebrate a goal last season. For hockey fans that are looking for a more guaranteed exciting outing, they would be wise to check out the Saskatoon Blades home opener on Friday at 7 p.m. at the SaskTel Centre, when they take on their archrivals the Prince Albert Raiders. Last season, the Blades finished last in the entire WHL with a 19-49-2-2 mark, as they continued to rebuild from hosting the 2013 Memorial Cup and from the fact they also traded away picks and prospects to land Brayden Schenn for their 2011 post-season run, which ended in the second round. This will mark the third season the Blades will be under the ownership of Edmonton product Mike Priestner, and the hard work his staff has put in should yield some more tangible results in the 2015-16 campaign. Bob Woods, who is the team’s head coach and general manager, and Dean Brockman, who is the club’s assistant coach, are both entering their second season guiding “the Bridge City Bunch.” Under their guidance last season, the Blades’ work ethic was solid, and most of their setbacks were by a goal or two. That has to be deemed as impressive, because the roster often contained a number of players that shouldn’t have been in the WHL. The effort was there, but the skill was not. The Blades continued to retool in the off-season, and they believe their talent level is higher. They had pieces last year like goaltenders Nik Amundrud and Brock Hamm, as well as offensive-defenceman Brycen Martin. It will be interesting to see what Yorkton product Jake Kustra can do as a 16-year-old rookie after showing he could provide a spark last season playing seven games as a 15-year-old call up on the back end. Overager Nick Zajac and 18-year-old sophomore Wyatt Sloboshan should be a steady influence up front. Around the action on the ice, the Blades were strong at pulling off various promotions last season, and one should expect the same this season. While construction leading to the SaskTel Centre could provide a hassle, Friday’s opener has the makings of being a crowd pleaser. The Hilltops defence pressures Edmonton QB Bradley Launhardt. The venerable Saskatoon Hilltops couldn’t have asked for a better way to cruise into their bye week. On Sunday at Saskatoon Minor Football Field, quarterback Jared Andreychuk threw four touchdown passes to pace the Toppers to a 49-17 victory over the visiting Edmonton Huskies. With the win, the Hilltops improve to 6-0, and they have won their last 14 straight contests including regular season and playoff action dating back to last season. Saskatoon only needs to win or tie one of its last two regular season games to lock up first place in the Prairie Football Conference. The defending Canadian Football League champs would also lock up top spot in the conference if the Calgary Colts (3-2) suffer a loss or a tie in one of their final three games. In Sunday’s win over the Huskies (1-4), the Hilltops were paced by the steady play of Andreychuk, who completed 13-of-20 passes for 162 yards, four touchdown passes and no interceptions. Andreychuk hit Evan Turkington, Davis Mitchell and Tyson Sawatzky for scoring strikes in the first quarter. The fourth-year signal caller found running back Colin Stumborg on a 13-yard scoring toss in the second quarter before giving way to his backups early in the second half. Des Vessey ran in a major from 14 yards out, the Huskies conceded a safety and Brett Thorarinsson hit a 16-yard field goal to give Saskatoon a 40-0 lead. Edmonton kicker Cole Sabourin nailed a 45-yard field goal on the final play of the first half to cut the Hilltops lead to 40-3. Jared Andreychuk fires a pass into the end zone for the Hilltops. The Hilltops increased their edge to 49-3 just 2:04 into the third quarter. The Huskies conceded another safety being pinned deep in their own end, and Hilltops rookie running back Adam Machart returned the ensuing kickoff 94 yards down the right sideline in front of the Edmonton bench for another major score. Edmonton had a couple of highlight moments in the fourth quarter. Linebacker Branden Modin intercepted Hilltops third string quarterback Brad Schnitzler and ran the ball back 40 yards for a touchdown to cut the Saskatoon lead to 49-10. Huskies quarterback Bradley Launhardt hooked up with receiver Darion Grymaloski on a 20-yard touchdown pass to close out the contest’s scoring. Launhardt had a solid day completing 19-of-32 passes for 203 yards, one touchdown toss and one interception. With the final result pretty much decided, the Hilltops played their reserves for most of the second half. Overall in the contest, the Hilltops had 10 different receivers catch a pass, nine different players carry the ball and four quarterbacks throw a pass. They only had 327 total yards of offence, with 264 of those being piled up in the first half. Turkington led the Toppers with 50 receiving yards on four catches. Vessey was Saskatoon’s top ground gainer with 36 yards on four carries. Grymaloski topped the Huskies with 54 receiving yards on three catches, while running back Jimmie Airey led all rushers with 81 yards on 18 carries. Adam Machart returns a kickoff for a TD for the Hilltops. The Hilltops defence limited the Huskies to 307 yards of total offence. Joshua Melnyk, James Vause, Adam Benkic, Cameron Schnitzler and Blake Hermann tied for the Hilltops team lead in tackles in the contest at three. Hilltops rookie defensive back Ryan Melnyk had an interception in the fourth quarter. Saskatoon also went deep into the playbook, which included Brad Schnitzler completing a pass for a first down on a fake field goal in the first quarter. The Hilltops return to action on Oct. 4, when they travel to Edmonton to take on the Wildcats (1-4). Saskatoon closes the regular season hosting the Colts on Oct. 11 at 1 p.m. at Saskatoon Minor Football Field. If you want to pass along any comments about this blog post, feel free to email them to stankssports@gmail.com. Check Twitter for more game photos @StanksSports. The Huskies defence stuffs Rams tailback Atlee Simon. The University of Saskatchewan Huskies weren’t going to get beaten on the ground this time. In opening the Canada West football season with two straight losses, the Huskies gave up an average of just over 260 yards rushing in each of those contests. On Friday night at Griffiths Stadium, the Dogs game up only 53 yards rushing to the visiting University of Regina Rams in earning a 33-18 victory before 6,476 spectators. Rams star tailback Atlee Simon, who ran for 396 yards in his club’s first two games, only managed 33 yards running on 11 carries against the Huskies. The U of S starting defensive line of Evan Machibroda, Liam Graham, Tristian Koronkiewicz and Donovan Dale needed to answer the bell, and they did. On offence, the Huskies hit top gear with their running attack piling up a season high 230 yards rushing as a team. Feature back Tyler Chow collected 124 yards on 15 carries, while change of pace back Shane Buchanan ran the ball 14 times for 87 tough yards between the tackles scoring one touchdown. The effectiveness of the Huskies rushing attack allowed fourth-year quarterback Drew Burko to have his most effective game of the season completing 19-of-30 passes for 243 yards, three touchdown strikes and no interceptions. Receiver Mitch Hillis was the main target catching nine passes for 135 yards and two scores. The Huskies (1-2) weren’t perfect and did make mistakes, but Friday’s effort was a total team victory, which caused the Rams to remain winless at 0-3. Early on, it appeared the Huskies struggles were going to continue. The Rams opened the scoring in the first quarter on a nine play, 95-yard drive culminating in a two-yard TD run by Simon. The score was set up when Rams quarterback Noah Picton hit Riley Wilson on a 31-yard post pattern that set the visitors up on the Huskies two. Shane Buchanan rumbles downfield for the Huskies. The Dogs cut the gap to 7-5 on a field goal and safety before the game’s momentum really swung in their favour. On the ensuing kickoff after the Rams gave up a safety to make the contest a two-point game in the second quarter, Yol Piok had a monster return for the Huskies to set the hosts up at the Rams 15. Two plays later, Burko hit Hillis for a 15-yard scoring strike to put the Huskies up 12-7. A short time later, Huskies defensive back Chris Friesen intercepted Picton and returned the pick 42 yards to the Rams 15. Two plays later, Burko hit Piok for a 13-yard scoring toss to put the Huskies up 19-7. The Rams kicked a field goal just before halftime to cut the Huskies edge to 19-10. That set the stage for the Huskies to overcome another bad trend. In their first two contests, the Dogs scored a total of 14 combine points in the second halves of both those outings. They matched that total in the second half against the Rams. After U of S linebacker Dane Bishop recovered a Rams fumble in the third quarter, the Huskies manufactured a seven play, 65-yard scoring drive that was capped by a two-yard Buchanan TD run. The Huskies kick cover unit takes down Ryan Schienbein of the Rams. Early in the fourth quarter, the Huskies recovered a Rams fumble on a punt return and turned that gift into another seven points, when Burko hit Hillis for a nine-yard scoring strike to put the hosts up 33-10. The Rams closed the game’s scoring when Noah Picton hit Mitchell Picton on a 37-yard scoring strike, and the two proceeded to connect on a two-point convert attempt. Noah Picton had success through the air completing 28 of 43 passes for 422 yards, which included hitting Wilson six times for 141 yards. The Rams couldn’t survive the turnovers they committed and the fact they couldn’t run the ball. The Huskies looked better than they had all season and took a big step forward. They will try to keep taking steps forward in the current Canadian Interuniversity Sport season this coming Friday, when they travel to Vancouver to face the University of British Columbia Thunderbirds. Following that clash, the Huskies face the powerhouse U of Calgary Dinos (3-0) in a home and home series. The Huskies and Dinos meet on Oct. 3 in Calgary and again on Oct. 16 at 7 p.m. at Griffiths Stadium. If you want to pass along any comments about this blog post, feel free to email them to stankssports@gmail.com. Check out Twitter for more game photos @StanksSports. Huskies RB Tyler Chow breaks away from the Bisons. It may only be Week 3 of the Canada West football season, but the University of Saskatchewan Huskies have to play with some urgency now. After dropping a 38-26 decision to the University of Alberta Golden Bears last Friday in Edmonton, the Huskies, who entered the 2015 campaign with expectations of challenging for the Vanier Cup, fell to 0-2. If they fall to the University of Regina Rams (0-2) this coming Friday on home turf at Griffiths Stadium (7 p.m. start) in a battle of winless teams, the Huskies would be an unthinkable 0-3. It is hard for anyone to recall the last time the Huskies opened a football campaign at 0-3. They last missed the post-season in 2000 with a 2-6 mark but started out 2-2 before closing out on a four-game skid in the final season with star Vanier Cup winning quarterback Ryan Reid calling signals. It is still possible for a team to dig itself out of an 0-3 hole, win Canada West and challenge for a Canadian Interuniversity Sport title, but that is a very hard road to travel. It is more optimal to be 1-2 going into the final five games of the Canada West regular season. After going 6-2 in 2014 and hosting a home playoff game for the first time since 2010, big things were expected of the Huskies this season. They improved as the 2014 campaign moved on and returned a large number of veterans for the 2015 campaign. Unfortunately, it seems like the hangover from last year’s post-season loss to the University of Manitoba Bisons in the Canada West semifinal round is still present. In that contest, the Huskies held a 37-18 third quarter lead before falling 47-39. The comeback came because the Bisons scored 14 points off a pair of interceptions including a pick-six, a major off a blocked punt, a field goal off a fumble and a safety caused by a bad snap. The setback was also the sixth in a row in the post-season for the Dogs. The Huskies have had big troubles making run stops like this. The Huskies began 2015 by thumping the Wilfred Laurier Golden Hawks 33-10 in an August exhibition tilt at Griffiths Stadium. U of S proceeded to open the Canada West regular season dropping a 34-28 decision at home on Sept. 4 to the Bisons before losing last Friday in Edmonton. A couple of disturbing trends could be seen in both games. In the opening week loss to the Bisons, the Huskies only scored six points in the second half, and they surrendered 514 yards of total offence in the contest including 246 yards on the ground. Fourth-year quarterback Drew Burko threw four costly interceptions for the Huskies, which turned out to be the key factor in the loss. Burko was up front saying he had to learn from his mistakes during various media interviews leading up to the clash with the Golden Bears. He handled the aftermath of the loss to the Bisons better than most professional quarterbacks. Huskies head coach Brian Towriss was also great with the media in his classic and accountable tell it like it is style, which included pointing out the Bisons made a couple of outstanding plays on two of Burko’s picks. Burko couldn’t be faulted in the setback to the Golden Bears. He completed 30 of 51 passes for 333 yards without throwing an interception. The Huskies led 18-0 at halftime before the wheels fell off. Playing before 3,200 spectators at Foote Field, the Golden Bears outscored the Huskies 38-8 in the second half in a surprising comeback win. U of A also piled up 583 yards of offence including 283 yards on the ground. The Huskies inability to score in the second half and the fact they are allowing opponents to gain way too many yards – especially on the ground – is startling. The huge rushing totals the Dogs are giving up basically means their defensive line is being dominated at the line of scrimmage. If they don’t get tougher on the defensive side of the ball, the 2015 campaign will become a long one on the adversity front. When the offence hits a rut, they might want to take a page out of their past to get out of it. In the early 2000s when the offence stalled, the Huskies would give the ball to power back Tyler Siwak, who ran through people gaining five and six yards in a cloud of dust. So impressive were Siwak’s power runs that the crowds at Griffiths routinely rose to their feet and saluted with loud ovations. Power runner Andre Lalonde has been a seldom used option by the Huskies. The Dog have that type of back in Andre Lalonde, who was nicknamed “The Bowling Ball” during his time with the Canadian Junior Football League’s Saskatoon Hilltops. Lalonde has four touches over two games, and he needs to be utilized more. Tyler Chow is a great feature back, but Lalonde brings a change of pace that is much needed. The Huskies need to get the bad trends turned around now in their next game against the Rams. If they don’t, the Dogs may face an avalanche they won’t be able to recover from. In a twist, the Rams fell by close margins in their first two games, so they need to be feeling some urgency as well. The U of R fell at home in Week 1 to the Golden Bears 29-22 and dropped a 27-20 decision in Week 2 to the University of British Columbia Thunderbirds in Vancouver. U of S needs to be the more desperate team on Friday, if they hope to take the first step to turn things around and start meeting high expectations. If you have any comments you want to pass on about this blog post, feel free to email them to stankssports@gmail.com. Evan Turkington cradles in the winning TD for the Hilltops. REGINA – Jared Andreychuk had the moment all quarterbacks dream about. With under three minutes to play and his Saskatoon Hilltops trailing the host Regina Thunder 25-19 on Saturday night at Mosaic Stadium, the fourth-year signal caller took the field to lead a two-minute drill type drive to win the Canadian Junior Football League contest. Andreychuk engineered a 75-yard march that ended with him hooking up with receiver Evan Turkington on a 13-yard scoring toss. Turkington made a twisting circus catch in the Regina end zone to give the Toppers a 26-25 lead with 75 seconds to play before 825 spectators. That score held up as the final result. On the ensuing Regina series, Hilltops linebacker Cole Benkic intercepted Thunder quarterback Jaeden Marwick to seal the outcome that allowed the Hilltops to improve to 5-0 to remain first in the Prairie Football Conference. The Thunder, who held an 18-7 lead at halftime, fell to 3-2 with the loss to remain second in the PFC. “It is just a lot of fun,” said Andreychuk. “Even at halftime, we were down. We are not having the best game, but we are having fun. Saturday’s clash looked like it would be a back-and-forth game until a key turning point occurred late in the first half. With Regina holding an 11-7 edge, the Hilltops ran a play-action pass on a short yardage situation near midfield, but Andreychuk was intercepted thanks to a stellar defensive play by Thunder linebacker Paul Toth. Regina drove down to the Saskatoon two, and Marwick muscled in for a score on a running play from two yards out to put the Thunder up 18-7 going into halftime. The Hilltops opened the second half cutting the gap to 18-10, when kicker Brett Thorarinsson booted a 23-yard field goal on a series that was set up by an interception from defensive back Luke Melnyk. The Thunder responded with just under five minutes to play in the third quarter, when Marwick hit Thomas Bresciani on a scoring toss from nine yards out to put the hosts up 25-10. Going into the fourth quarter, the Hilltops cued the comeback. Just 1:38 into the final frame, Andreychuk connected with receiver Davis Mitchell on a seven-yard scoring toss to cut the Thunder edge 25-17. Cole Benkic returns an interception for the Hilltops. With 5:26 to play in the fourth, the Thunder conceded a safety after being pinned deep in their own end, which cut their lead to 25-19. That set the scene for the Toppers late game-winning drive. “I think just the way we came out of the locker room in the second half was huge,” said Andreychuk. “It is easy to have your head down, when you’re down a couple of touchdowns at half, and we came out hot. Saskatoon swept the season series with Regina 2-0 having downed the Thunder 35-17 at Saskatoon Minor Football Field on Sept. 5. Thanks to the sweep, the Hilltops won Shrine Bowl, which is given to the team that wins the regular season series between the two clubs. The Thunder won both encounters with the Hilltops last season to take the Shrine Bowl. Andreychuk completed 21 of 40 passes for 336 yards, three touchdowns and three interceptions for the Hilltops on Saturday, while Marwick completed 24 of 41 passes for 420 yards, two touchdowns and two interceptions for the Thunder. While the two teams piled up the offensive yards with Regina outgaining Saskatoon 517 to 447, the defences on both sides made big plays as well. There were also some obvious blown calls by the officials, but the mistakes evened out both ways. Mitchell had a TD catch in the second quarter to account for Saskatoon’s first score. Tailback Victor St. Pierre Laviolette had a 27 yard scoring catch, while Kristopher Calcutt kicked a field goal and a rouge from a missed field goal to account for the Thunder’s first 11 points. Entering the 2015 regular season, the Thunder had won their four previous encounters against the Hilltops including action in the regular season and playoffs. Andreychuk was pleased his club could turn the tables on their provincial rivals winning both regular season head-to-head matches in the current campaign. The Hilltops return to action on Sept. 20, when they host the Edmonton Huskies (1-3) at 1 p.m. at Saskatoon Minor Football Field. If you have any comments to pass along about this blog post, feel free to email them to stankssports@gmail.com. Check out more game photos on Twitter @StanksSports. The Hilltops' Logan Fischer was too much for the Thunder to handle. The Saskatoon Hilltops unleashed “The Beast” in Logan Fischer on the Regina Thunder. The third-year tailback had a career night rushing for 293 yards on 32 carries to help the Toppers down their provincial rivals 35-17 at Saskatoon Minor Football Field on Saturday night. Fischer ran around, past and through the Thunder defenders, and he also caught a pair of passes for 26 yards in the Canadian Junior Football League battle. His efforts grew in importance as the night progressed. The two clubs began Saturday’s clash playing in cool but fairly pleasant conditions. A mist began to fall during the second quarter, and it turned into a monsoon for the entire second half. The heavier rainy weather worked out in favour of the Hilltops, who were locked in a 14-14 tie with the Thunder at halftime, but rolled to victory as the conditions worsened. The Thunder, who have a strong passing game and like to favour it, saw their aerial show get grounded. The Hilltops pounded their way to victory thanks to Fischer’s numerous gritty runs. He also benefited from the fact the Toppers offensive line blocked well, and the receivers did their part to seal off Regina’s defensive backs. Logan Fischer piled up 293 yards rushing for the Hilltops. When the two teams began their fight for top spot in the Prairie Football Conference, it appeared the game would be a tight affair. Regina controlled the contest for much of the first quarter and took a 7-0 edge, when quarterback Jaeden Marwick slipped a nine-yard outlet pass to an uncovered Colton Klassen. The scoring drive was aided by the fact Marwick connected with receiver Kasim Ocaya on a 49-yard bomb. Momentum changed early in the second quarter, when Marwick was intercepted near midfield by Hilltops cornerback Arnold Osam. Osam ran the ball back to the Regina 22, and on the ensuing play, Hilltops quarterback Jared Andreychuk hit wide receiver Chad Braun in the end zone to tie the contest up 7-7. A short time later, the Thunder appeared to wrestle momentum back in their favour blocking a Saskatoon punt and recovering the ball on the Hilltops five. Two plays later, Marwick hit Thomas Bresciani on a short four-yard TD toss to put the visitors up 14-7. Saskatoon tied things up shortly before the first half came to an end. After a short Regina punt, the Hilltops started a drive on the Thunder’s side of midfield and tied the contest up 14-14 on a three yard run by Fischer with 49.7 seconds to play. When the downpour of rain came at the start of the second half, the Hilltops jumped ahead 28-14. First, Andreychuk hit Evan Kopchynski on an 18-yard strike, and the signal caller later ran in for a major from nine yards out. Kristopher Calcutt kicked a short 12-yard field goal for the Thunder before the third quarter ended to cut the Saskatoon lead to 28-17. Jared Andreychuk (#5) celebrates a TD run with his teammates in a monsoon. The Hilltops iced the game just past the midway point of the fourth quarter on a one-yard touchdown run by starting right guard Drayke Unger, who went as a fullback for the short yardage situation. While Fischer was the game’s star, Andreychuk completed 9-of-18 passes for 158 yards including his two touchdown tosses. He managed to avoid throwing an interception in the adverse conditions. Marwick completed 15-of-25 passes for 184 yards, two touchdown strikes and two picks. Klassen was the top ground gainer for the Thunder running for 83 yards on 17 carries. With the win, the Hilltops improve to 4-0, while the Thunder fall to 3-1. The two rivals meet again this coming Saturday at 7 p.m. at Mosaic Stadium in Regina. If you have any comments or thoughts you would like to pass on about this blog post, feel free to email them to stankssports@gmail.com. Wright doesn't expect UFC to make a quick return to Sask. Tom Wright speaks to a crowd at Saskatoon's O'Brians Event Centre. The UFC’s first stop in Saskatchewan will likely be its only stop in the next number of years. Tom Wright, the UFC’s executive vice-president and general manager for Canada, Australia and New Zealand, wants to bring the promotion back to the “Wheat Province.” The premier professional circuit for mixed martial arts held UFC Fight Night 74 at Saskatoon’s SaskTel Centre on Aug. 23 before 7,202 spectators bringing in a gate of $949,000. Wright was pleased with the gate. Standing in the way of a Saskatchewan return is the fact the UFC brass has a lengthy list of Canadian communities they want to visit. “It will probably be a few years, because there are a bunch of other cities across the country that we’ve never been to,” said Wright. “We’ve never been to Windsor. We’ve never been to Edmonton. We’ve never been to Ottawa. We’ve never been to St. John’s. We’ve never been to Victoria. With that said, Wright was happy with how well things went for the fight card in Saskatoon and with the various functions the promotion put on across the city in the three days leading up to Fight Night 74. “We’ve been planning to have this event for quite some time,” said Wright. “We came here last year with the UFC Experience, when we went to Regina. We were really well received. Wright is keenly aware about how passionately people in Saskatchewan can get behind a sporting interest. From 2002 to 2007, he was the commissioner of the CFL and gained a lot of experience with how much emotion fans of the Saskatchewan Roughriders invest in their team. Fans enjoyed checking out the UFC Experience outside the SaskTel Centre. When government of the province where the colours of green and white dominate passed the Athletics Commission Act in early March, it allowed "The Land of the Living Skies" to hold professional combat sporting events like mixed martial arts. In bringing the UFC to the province for the first time, Wright said the organization wanted to have a main event that would be a crowd pleaser. He believed a featherweight tilt between Max Holloway and Charles Oliveira would fit that need. Heading into that fight, Holloway was rated fifth in the UFC’s featherweight rankings, while Oliveira was seventh. The card experienced a bit of bad luck on that front, when Oliveira was forced to retire at 1:39 of the first round due to injury. After an exchange, the Sao Paulo, Brazil, product started to favour his right shoulder. Oliveira went down and the fight was stopped, giving Holloway a knockout victory. The co-main event between Neil Magny and Erick Silva lacked action, but Magny managed to win by split decision. The 10 bouts leading to the main event matches were really good, so fans did get bang for their buck. The welterweight fight between Patrick Cote and Josh Burkman, which was given fight of the night honours, was a back and forth physical battle. It ended at 1:26 of the third round, when Cote, who is a fan favourite from Rimouski, Quebec, knocked out Burkman. 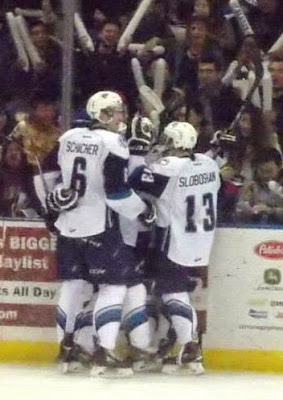 The crowd at the SaskTel Centre rose to their feet to give their loudest ovation of the night. “I thought the evening was terrific,” said Wright. “The crowd was here early. Half the building was filled before the first fight. Cote said he could feel the crowd’s passion during his stop in Saskatoon. “They are great fans here of mixed martial art,” said Cote. “For sure when you are from the country, you feel the support. During the UFC’s stop in Saskatoon, the athletes were pretty engaging with the fans that they met. Cote was a huge fan favourite, and his opponent, the veteran Burkman, often spoke with a soft heart. “It is great, because there is still a lot of misconception about our sport,” said Wright about the athlete’s interactions with the fans. “There are myths that need to be dispelled and perspectives that need to be informed. “The best spokespeople are our athletes. They are engaging, they are intelligent, they are well-spoken and the vast majority have university degrees. These guys and girls are tough competitors, but they are very honourable competitors too. The UFC makes a donation to Special Olympics Canada in Saskatoon. During his five-plus years with the UFC, Wright said the organization has made big growth. The fact Fight Night 74 was held in Saskatoon marked another milestone for the promotion in Canada. “When we first started, we weren’t sanctioned in Ontario, we weren’t sanctioned in B.C., Saskatchewan,” said Wright. “We only held events in Montreal. Wright said there are a few differences between working as a high executive with the UFC and CFL. The differences include the fact Canadian professional football has been around for over 100 years, while the UFC has been around for just over 20 years and is a global sport. The similarities are numerous, which has made work for the UFC feel quite natural. “The Canadian Football League you are dealing with world class athletes who train hard and are committed to make sacrifices,” said Wright. “Mixed martial artists are no different. They are world class athletes, hard-working and they train like nobody else. The athletes are very similar. I was back in the Saskatoon Express this week writing a column about the UFC making a return to Saskatchewan. That column can be found right here. If you have any comments or thoughts you would like to pass along about this blog post, feel free to email them to stankssports@gmail.com. Huskies QB Drew Burko (#2) threw four picks in Friday's loss to the Bisons. Drew Burko will want to destroy the video of that contest. The fourth year starting quarterback for the University of Saskatchewan Huskies football team did not have his best day throwing four costly interceptions Friday night in a 34-28 loss to the University of Manitoba Bisons at Griffiths Stadium before 6,457 spectators. Burko threw two of his interceptions inside of the final two minutes of the CIS regular season opening contest for both squads. Fifth-year veteran Zack Sandelescu made the first late pick for the Bisons with 1:21 to play, while fourth-year vet Cam Teschuk came up with the second pick that iced the game for the visitors with 31 seconds to play. On at least three of his interceptions, Burko was locked in on his intended receiver for a lengthy time, which allowed the Bisons defensive backs to zero in on the throw. While the picks late in the fourth quarter punctuated the loss, the veteran signal caller’s two second quarter interceptions were just as costly. Just before the halfway point of the second stanza with the Huskies up 20-14, Burko threw an interception at the goal-line to Bisons defensive back Tyler Fong. After the U of M went ahead 24-22 late in the second quarter, Burko drove the Huskies downfield only to get picked at the Bisons three by Eric Plett with 16 seconds remaining before halftime. Burko completed 24-of-46 passes for 318 yards, which included hitting Gilmer, Texas, product Tevin Godfrey for a 30-yard score that gave the hosts a 20-7 lead early in the second frame. Bisons quarterback Theo Deezar connected on 17-of-28 attempts for 268 yards, two touchdown passes and two interceptions. After the Huskies went ahead 20-7, Deezar immediately responded by engineering a quick five-play, 80-yard drive that was capped with an acrobatic 27-yard touchdown catch by receiver Alex Vitt to cut the Huskies edge to 20-14. Rookie Jamel Lyles shreds the Huskies defence on a run. Early in the fourth quarter with the Huskies holding a 28-24 lead, Deezar connected with Lerenzo Ihanza on a 58-yard positive bounce touchdown pass to put the Bisons in front 31-28. Ihanza caught a deep pass that deflected off the hands of a Huskies defensive back and proceeded to run in for the winning score. The Huskies had other opportunities that slipped through their fingers. Leading 8-0 in the first quarter, they blocked a punt to start a drive 12 yards away from the Bisons end zone. The hosts were held to a field goal in going up 11-0. Up 11-7 after a three-yard TD run by Bisons running back Cameron Fox, the Huskies were stopped on a third-and-goal gamble from a yard out, when back-up quarterback Kyle Siemens couldn’t find his way to paydirt against a tough Bisons front. Siemens had the game’s first major on a one-yard sneak. The Dogs had to lament their missed chances, but the Bisons have to be given full credit for taking the game away from the host side. The visitors also held a huge edge along the ground piling up 246 yards rushing to the Huskies 116. Bisons rookie tailback Jamel Lyles led all ground gainers with 155 yards on 11 carries, which included a lightning fast 58-yard dash in the second quarter that cut a 22-14 Huskies edge to 22-21. Tyler Chow topped the Huskies in rushing with 109 yards on 17 carries. Preston McIntyre recovers a Bisons fourth quarter fumble for the Huskies. Ryan Jones hit a 29-yard field goal to give Manitoba a 24-22 lead at halftime. Saskatchewan kicker Sean Stenger hit a 17-yard field goal early in the third quarter and 28-yard field goal on the first place of the fourth quarter to put his side up 28-24. After Ihanza’s touchdown catch, Jones nailed a 10-yard field goal to put the Bisons up 34-28. Saskatchewan appeared to be poised for some last minute heroics, when sophomore defensive lineman Preston McIntyre recovered a Bisons fumble at the Huskies 26 with 1:49 to play. Burko’s final two interceptions ended any hopes of a two-minute drill win. The Huskies return to action this coming Friday, when they travel to Edmonton to face the University of Alberta Golden Bears. It was a result that can only be labeled as unfair. On Thursday, Dominic Rooney, who was less than a month and a half away from his third birthday, passed away after almost a two-year battle with acute myeloid leukemia. Dominic was the son of Sean and Trish Rooney of Medicine Hat, and Sean was my sports editor at the Medicine Hat News. During Dominic’s battle with cancer, Sean documented his family’s journey with a spectacular and heart-wrenching blog. After doctors said Dominic’s condition was terminal, he defied the odds by continuing to live for 36 weeks. Just hours after Dominic’s passing, Sean crafted one his best pieces ever to report his son’s final moments. That specific post can be found here. As the Rooney family went through their journey, they were warmly supported by the citizens of Medicine Hat through a variety of fundraisers. In his valiant fight, Dominic inspired many and brought out the best in the Gas City.